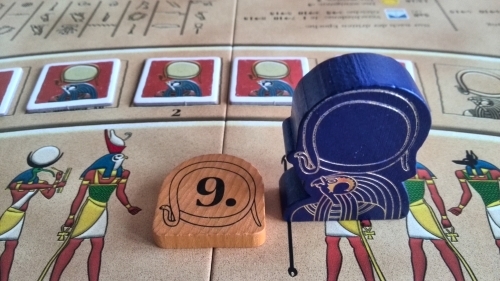 Ra is an auction and set collection board game with – you guessed it – an Egyptian theme. It has really nice artwork and components, plays in under an hour (from two to five players) and can be picked up for less than £25. The game was first published back in 1999 when designer Reiner Knizia was at his creative peak: between 1997 and 2005 his releases included Tigris & Euphrates, Samurai, Battle Line and Amun Rai – alongside two of my favourites; classic abstract Ingenious and the light dice/domino filler Pickomino. The game is played over three identical rounds. In each, players take turns to either draw a tile from a bag and add it to those in the next auction. The winner of said auction takes all the tiles (some may be negative) and adds them to their haul. The advantage of starting the auction is that you’ll bid last – and each person only gets one chance to bid. A possible downside is that if no one else bids, you have to – not great if you started the auction in an attempt to force someone else’s hand! Several things make this game unique. First, each player only has a small number of bidding chits in each round. For example, in a three-player game one person will start with the chits 3,6,9 and 12, another 2,5,8 and 13 etc. The game starts with the 1 chit in the centre of the board; the winner of that first auction will place their own winning chit (perhaps the 12) in the centre and take the 1 (placed upside down to show it cannot be used this turn), along with the tiles won. They’re now stuck with the 1 chit as one of their four bids for the next round. To ramp up the tension, some of the tiles are red ‘Ra’ tiles. These go on a separate track and when a certain number (6-10, depending on the number of players) have been drawn the round will end no matter how many bidding rounds you’ve won. So it is possible (if highly unlikely) the round could end before you had won a single tile – leaving you to go to the next round with the same four bidding chits. Otherwise, a round ends when all players have used all their bidding chits. One of Ra’s real strengths is its simplicity. The game’s mechanisms are super simple and most players will pick up the flow of play within the first couple of auctions. However, there’s obviously a bit more to the game than the simple flow of play. The clearest obstacle to entry is the scoring. There are six different types of scoring tile, each of which scores differently. Not only do they add up differently, but they also score at different times during the game – some round-by-round and some at the end. In addition, some tiles are kept throughout the game and others are discarded after each scoring round. It’s a definite hurdle for newbies if playing against more experienced players, but it should only take a game or two to pick up. Another possible hurdle is knowing when it’s good to start a bidding round – and this is something you simply can’t teach. Players good at reading others, or playing poker, will have a definite advantage here. And unfortunately some gamers simply aren’t ever going to be good at it – and worse, may find it an intimidating experience. The writer: For a title with so few basic components, I’m always amazed at how differently every game of Ra plays out. As with poker much of the game is played in the mind, but there’s so much more actual game here. At the same time, the tile picking randomness can totally change the nature of a round – but as it effects everyone equally, wild swings of luck in the draw very rarely ruin a game. The thinker: While randomness and mind games may seem to be the overriding factors at work here, the open player information is still your friend if you can see past the chaos. You can see what tiles and chits everyone has; you can work out the odds of how long rounds will last; so you can compete – and I think it’s fantastic. But some will still hate it for the randomness. The trasher: Auction games can be a bit dry and boring, but the mind games here make it work – as does the clever blend of randomness and control. Have a rubbish set of bidding chips? Call ‘Ras’ early and watch your opponents squirm – or hold out to be the last player with a chit, then gamble it all to see what comes out of the bag. Gambling and messing with people’s heads – what’s not to like? The dabbler: Normally I like a lot of player interaction, but all it takes is one player to not be on board with Ra and suddenly its a long, awkward game! Shorter auction games are often light affairs, but don’t be fooled; this game can get quite intense when played with the wrong people – or right ones, depending on your opinion! If you don’t like it, there is a lighter dice version called Ra: The Dice Game which uses the same clever scoring mechanisms. As with any game, there are of course dissenting voices. Looking through the comments of those who really despise Ra the common themes tend to be that there’s no strategy, too much randomness, a weak theme and simple, repetitive game play. Reading that sentence, I wouldn’t want to play it either! One thing is for certain – this is not a thematic game. The Egyptian art is very much pasted over what is essentially a mathematics/mind game puzzle/experience. It could just as easily have had a sci-fi, fantasy or Mediterranean theme thrown over the top. So if this is going to be an issue for you, Ra may not be the game for you. The other complaints, as a whole, point towards a particular kind of gamer. If you only like deeply strategic games with a myriad of complex action options each round then again, no, this game is not for you. But I think that is a small subset of the gaming community. Yes, the choice you make is in essence a simple one each round; and yes, there is an awful lot of randomness in how the tiles come out – which even effects game and round length. But to the majority of gamers this randomness points to replayability rather than anything negative, while the simplicity of the actions is necessary to let the more important aspect of reading other players and mind games shine through. 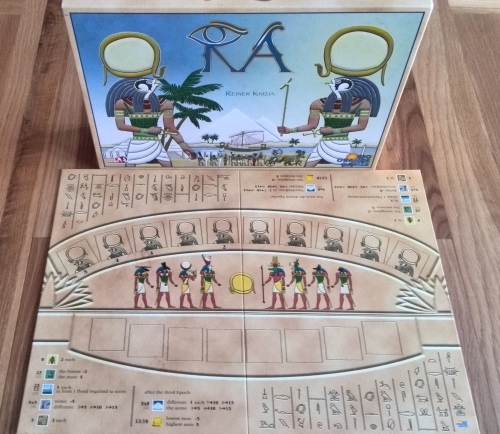 I’m a big fan of Ra, which has been one of the most played games (close to 50 games by the end of 2013) in my collection since I purchased it back in 2010. It’s one of the few games I rate a ‘nine’ and it has worked well with almost everyone I’ve played it with. The game sits in an impressive 69th place on the all time BGG list with an average rating of more than 7.5 (Jan 2014). In fact, its probably the safest game I could pick off the shelf with friends I consider ‘gamers’. I’m not always keen on auction games and if you’re the same, I would certainly say give Ra a chance. Many gamers consider it to be the best auction game out there and it’s certainly the best I’ve come across. And if you also enjoy a gamble, as well as player interaction that’s in the mind instead of on the board, it’s a sure fire winner. Highly recommended. This entry was posted in Board games, Games and tagged bidding game review, Bidding games, Board game review, board games, boardgame review, Ra, Ra review, tile game review, tile games by Chris Marling. Bookmark the permalink.